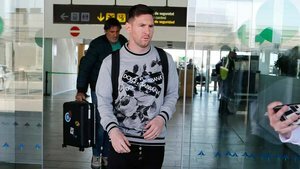 Leo Messi arrived at Barcelona early in the afternoon after leaving the Argentina training camp in Spain. The little magician is suffering from discomfort in his pubis after Argentina's 3-1 loss to Venezuela at the Wanda Metropolitano. Messi will continue his treatment in Barcelona and won't be involved in his country's second friendly against Morocco on Tuesday. His return didn't go as expected due to an inexperienced side failing to take control of the match. Without experience around him, the burden has only increased upon Leo and it showed against Venezuela. Despite the disappointing performance, Messi was desperate to pull on the Argentina shirt again.